Meeting with Governor of St. Petersburg Georgy Poltavchenko. Putin.BLOG Regions Meeting with Governor of St. Petersburg Georgy Poltavchenko. Mr. Poltavchenko briefed President Putin on the socioeconomic situation in St. Petersburg and the city’s development results for the first half of 2017. 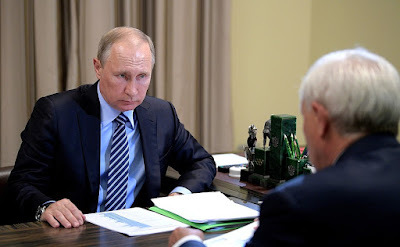 Vladimir Putin at the meeting with Governor of St. Petersburg Georgy Poltavchenko. Mr. Poltavchenko, we meet regularly, but more often in passing, at events not directly related to St Petersburg’s life. We agreed today to meet, however, and take a closer look at the situation in the city. I have come prepared, Mr. President. Let me start with the results for the first six months. The measures that we took on your instruction to ensure St Petersburg’s stable economic development over the difficult period in 2014–2016 have produced results. In principle, the results of our efforts over these first six months give us reason to speak with absolute confidence. The industrial production figures continue to rise and the city’s businesses continue to see a growing turnover. Output volumes shipped from the city were up by 10 percent compared to the same period last year. Most important is that the city’s own revenue is growing too, above all through tax revenue, and was up by around 12 percent. We thus have the conditions to be able to meet in full our social commitments to the city residents. Governor of St. Petersburg Georgy Poltavchenko. I note too that much work is underway to attract investment. Last year, the city attracted around 582 billion rubles in investment, which comes to practically a second city budget. We are continuing this work this year. Two-three years ago, we began work on these concrete investment projects and I would like now to invite you to attend the opening of one of them. This is a unique project, a strategic project. It is a public-private partnership, a project to build a proton beam radiation therapy center. 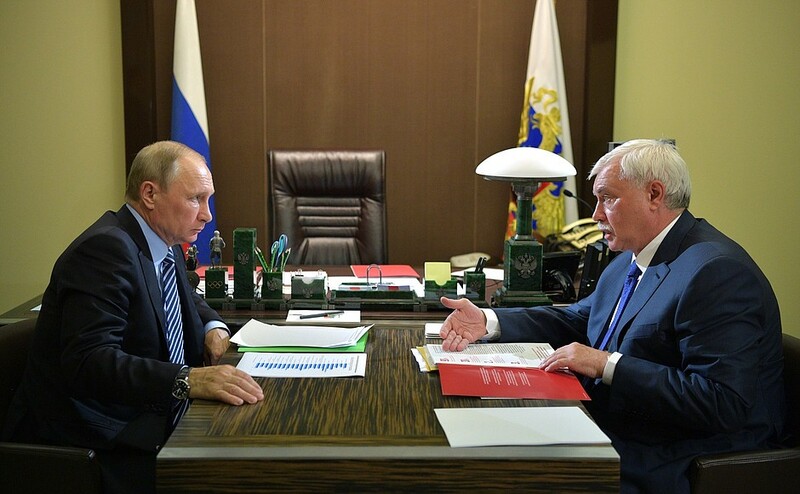 Vladimir Putin with Governor of St. Petersburg Georgy Poltavchenko. In St. Petersburg, in the Primorsky District. This is a really unique center. The results gained from proton beam therapy are impressive. This method is 90 percent more effective than other forms of radiation therapy. Patient survival rate after treatment is 30 percent higher than using traditional radiation therapy methods. Most important – and I would like to discuss this separately with the center's management, when you visit it, – this treatment is very effective in children. There is a practically 100-percent cure rate for children with leukemia and so forth. We could consider making the center a specialized facility for children. We plan to open it in October. In October? This is good. This project is important too because it is financed not by budget money but by private investment from investors working in the medical technology sector. This is why I wanted you to have the project description. I think this project is worth seeing. As you see, I have prepared a list of the issues which people raised during Direct Line. Regarding Primorsky District, this year is the Year of the Environment, and this district has the same problem that a number of other localities also face, unfortunately. This is the problem of dumps. People say that there have long been plans to clean up the dump but that this has not been done yet. Mr. President, we already took a decision prior to this meeting. The dump will cease taking rubbish this year and re-cultivation work will begin. Little rubbish is taken there already now, mostly construction waste, soil and construction waste used to be used as bund. But this is a huge dump. You probably know this well, it is in Novoselky, the site of the Toyota and Kia car plants. We plan to build a waste treatment plant there and re-cultivate the dump. 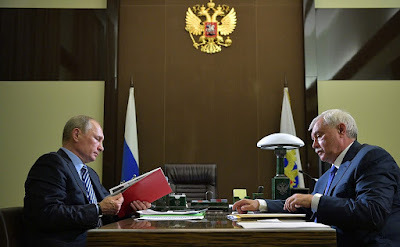 Working meeting with Governor of St. Petersburg Georgy Poltavchenko. Good, thank you. It is good to hear this. There are the city’s traditional problems too. I will not go into detail right now. You can look here. I have made particular note of some of these problems. I did not know that St Petersburg residents had a problem with new construction that increases building density in the city. There is very little of this in the city. I know that this has been a real sore point for Moscow residents, but this is the first time that I have heard it raised as a problem in St. Petersburg. It is good if you give this issue your attention. Look into it, because people are complaining about it. Yes, I will certainly do so. This is closely related to other issues also traditional for St. Petersburg, namely, preserving the historical center (you see that there are concrete issues raised here), and social provisions for people with disabilities. To be honest, this is a revelation for me. I will definitely look into it. The good thing about Direct Line is that it brings to light unexpected issues that are a revelation for many of us. But when people encounter problems, we must pay particular attention to this. I will pass everything on to you, and you take a look at it and then report back to me. On August 10, the first mayor of St. Petersburg, Anatoly Sobchak, would have been 80. Do you have any plans to mark this occasion? We do have preparations underway. We are not planning any real pomp, all the more so as Anatoly Sobchak’s relatives did not want any big ceremonies, but of course the city remembers its first mayor and we will hold the corresponding events to mark the occasion. There will be a memorial ceremony at the Nikolskoye Cemetery, where Anatoly Sobchak was laid to rest, and I will take part in this. All city residents who wish to honor Anatoly Sobchak’s memory are also welcome to attend. 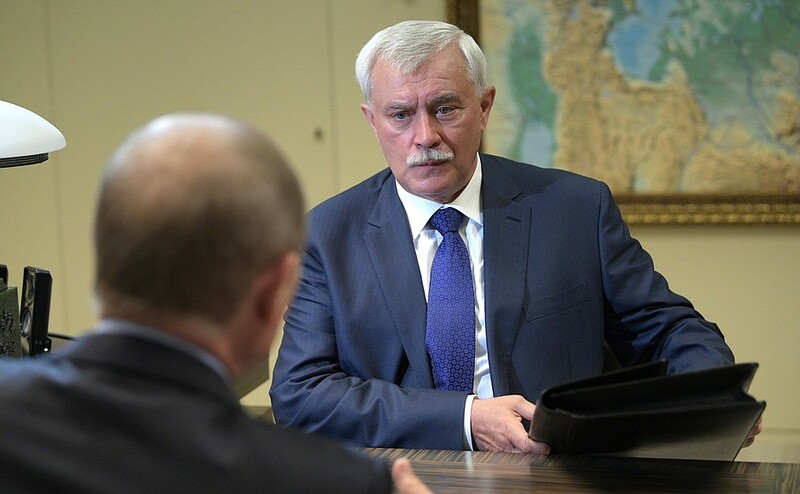 0 Comment to "Meeting with Governor of St. Petersburg Georgy Poltavchenko."